Based on more than 2 decades of experience as a top producer in the real estate industry in the Detroit Metro area, Fran Schlesinger has a wealth of knowledge to share. Her background and experience allow her to think strategically, provide disciplined advice and execute on that advice so that her clients reach their goals. she is a fierce negotiator and natural problem solver. Fran sells all types of homes - waterfront, magnificent estates, historic homes, cottages, bungalows, condominiums in gates communities - in all price ranges, specializing in luxury properties. Every home is unique. Every person is unique and everyone deserves to have a real estate experience that speaks to that uniqueness. Fran customizes every sale or purchase to fit the requirements of the client and property. She studies the market, she know the numbers. Residential real estate is part science and part art - one of the reasons Fran loves her job! 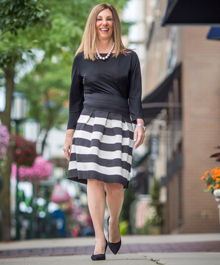 Humor, happiness and positive energy define Fran's work style. Her passion for real estate is reflected in her work ethic. Her clients, ranging from top Executives of Fortune 500 companies, celebrated physicians & attorneys, a multitude of company relocations, to first time home buyers, trust her judgment, rely on her integrity and count on her aggressive approach to their goals. Fran can ALWAYS be reached directly. Her clients NEVER work with an assistant. Fran takes great pride and concern in each and every client. She treats each client as she would want to be treated. Fran is your greatest advocate when selling or purchasing a home.